Home prices are nearly back to where they were before the crash. In some places, home prices are above where they were at the peak of the national boom. Yet, the impact of rising home prices has not had the economic effect that economists expected. The Wall Street Journal addresses the issue in Why the Housing Rebound Hasn’t Lifted the U.S. Economy Much. I think the journal misses the reasons by a mile, as does Moody’s Analytics chief economist Mark Zandi. Let's take a look. Such a level once would have offered a double-barreled boost to the economy by providing owners with more money to tap and making them feel more flush and likely to spend. But today, that newfound wealth has had little effect on behavior. 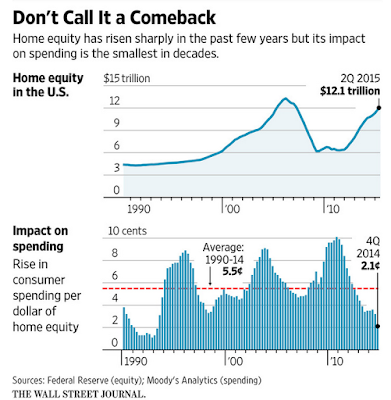 Home equity’s effect on consumer spending is at its lowest ebb since the early 1990s, according to Moody’s Analytics. The research firm estimates that every $1 rise in home equity in the fourth quarter of 2014 would translate to about two cents of extra consumer spending over the next 1 to 1½ years. 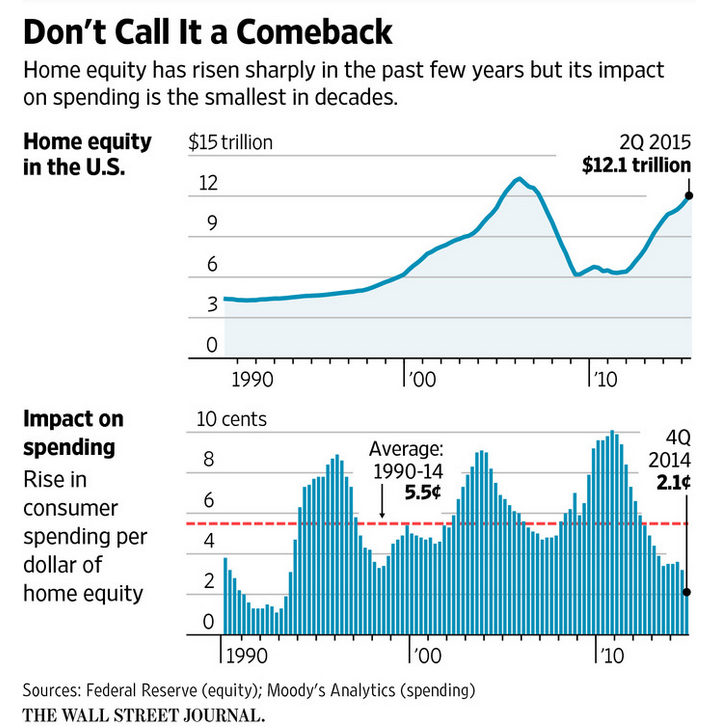 That was a third of the impact home equity had before the bust, Moody’s said. Why aren’t homeowners feeling flush again? For one thing, since rising home prices over the past few years largely have made up for ground lost during the recession, many owners might not even realize they have equity to tap. About 38% of metro areas had prices above their pre-2009 peak at the end of the third quarter, up from a 30% level last year, according to Moody’s Analytics and CoreLogic. A further 13% of metros are within 5% of their prebust peak. Boomers are not about to go on a spending spree based on the once widely held but now discredited notion that home prices always go up. Headed into retirement, boomers in general have more worries than whether or not their kitchen cabinets are up to date. Boomer home improvements will primarily pertain to replacing worn out heaters, air conditioning, or appliances, not remodeling. And millennials, especially women, still live at home in record numbers. For details, please see Women Not Leaving the Nest in Record Numbers; Marriage and Kids, Who Can Afford Them? How can you spend "home equity", when you don't even have a home? What about the need of boomers to downsize, not upgrade? What about health care costs for aging boomers? What about millennials who have to take care of their aging parents and don't have the means? Zandi expects the prior trend will resume. I propose we are not at inflection point. It's all in his head, and easy answers to the above questions on attitudes and demographics explain why.